In many ways, my arrival in Auckland has been a very British experience. I arrived to fog, drizzle and windy conditions, despite mid-January being the height of summer. Unlike my other travel experiences in Europe and the USA, New Zealand offers the reassuring ‘homey’ features of driving on ‘our’ side, ‘our’ approach to spelling, a good selection of quality hot tea and the Queen’s head on coins and dollar notes. In many ways, these features have made the transition easy and painless. Fortunately, in another example of British similarity, the weather can be rapidly changeable so after a sleep to get over the flight, I went for a long walk around the city in glorious sunshine with a refreshing breeze. People are very friendly and the city boasts a number of central neighbourhoods which have a ‘village feel’ e.g. Parnell, Mount Eden, Ponsonby, Newmarket and others. There is a relaxed vibe around the city – no one is in a rush and ‘sitting in’ for a coffee with friends seems de rigeur in the many gourmet artisan bakeries and book shops around the city. I can see that ‘the outdoors’ is important for Aucklanders. This is a city around which everyone walks (despite the hills) and the proximity of the water makes canoeing, kayaking and open water swimming popular. Even though there are cars and buses in the CBD, the air smells fresh and clean. 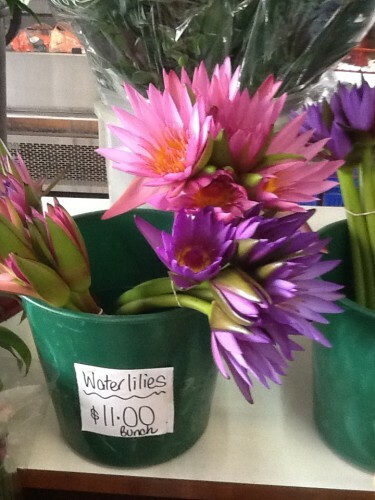 Cut water lilies for sale in Mt. Eden village – exquisite!